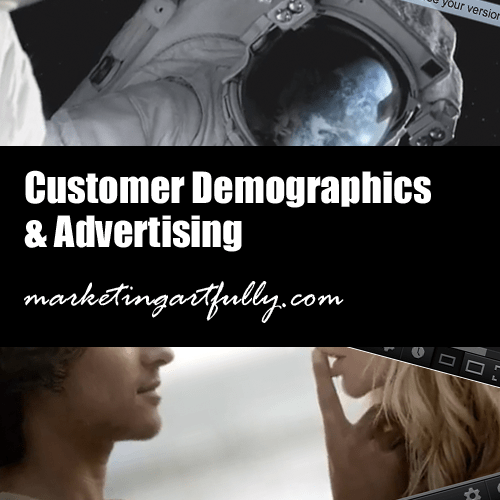 So I was talking with a client the other day about customer demographics and advertising…it was really enlightening saying it out loud and I thought that you might be interested too! Let’s start with what Customer Demographics mean to small business owners (for huge companies they may mean something totally different). In my business, I am trying to reach entrepreneurs, small business owners and realtors. ALL my clients tend to be between 35 and 60 and trend toward women (although we have our fair share of male clients). Additionally we do a lot of social media for technology companies, local businesses (doctors, lawyers, retail) and the hospitality industry (restaurants, spas and salons and resorts). With that in mind, I have to remember that techy is not a first language and that I need to make things comprehensible to them, not dazzle them with all my technical knowledge and industry buzzwords. If I was trying to attract partners like other designers and internet gurus I would need to use more technical talk. AND if I was trying to show my marketing chops I would have to make sure to be WAY more specific in Madison Avenue marketing terms. Are they in a particular industry? I do a lot of real estate marketing since that is an industry I came from and do more hospitality because one of my bases is Florida which has a lot of service industry. Serving an industry is sometimes called having a “niche” and many business owners are terrified to be “buttonholed” into a niche, thinking that it limits them. What it does is to make it easier to market to specific group of people! Are they just starting out or are they an established business? A LOT of my compatriots like to work with “newbies” or startups who are just getting going in their industry. I have to say that I fall on the other end, enjoying teaching advanced concepts and working with more established businesses (except for my one hour consults which benefit everyone). What is their age? Boy this one gets me into trouble! I like to work with people who have a little age and experience. The youngsters who need the latest and greatest thing are NOT my target market and my Alexa.com demographic info bears that out with the majority of my readers being “females who are in the age range 45-54, are college educated and browse this site from work.” If your site gets enough traffic to record data on Alexa it is a GREAT place to find out who is following you (just know that your social media audience may be WAY different than your website audience). What is their income range? Because I have a couple of different types of products (info products costing from $3-$250, coaching that is a little more and social media marketing services that have a higher monthly cost) I need a wide range of people financially! If you are selling something costing thousands, you need to know that you are in a luxury demographic and there are different ways to approach these folks. Motorola Ad – If you are are a reader of my blog, trending a little higher age wise, trending towards women and trending towards business, this ad is NOT for you. It is nice, a little love story, an anti iPhone theme (those little white headphones) and the “break out of the pack” and be different with your technology. Most business women (and men) that I see every day want a phone that does some simple function (take pictures, work with social media and answer calls). A phone IS NOT geared to providing an identity, they have well established identities already and are not looking to technology to build self esteem! Sears Appliance Ad – WOW do I think that Sears misses the mark on all levels here. First off it starts with a young couple traipsing through the sand, hugging and kissing. Then they run into the Sears appliances. Some ways I think this DOES NOT WORK!…first off, the couple is too young to appeal to baby boomers or Gen X buyers who are the ones with money to replace their appliances. A LOT of younger people are under-employed and are not buying houses (or shopping for appliances). Second off, the slapstick humor requires you watch the commercial end to end to understand the concept – if you are a woman (who make EIGHTY FIVE percent of brand purchases according to female marketing site she-conomy.com) the chances of you having time to scrutinize a commercial for 30 whole seconds! This ad for the Discovery Channel is great! It is happy, has a great soundtrack and snappy graphics. ALL great and I LOVE it, but I WATCH the discovery channel a lot (I know, NERD, guilty as charged) so it is not appropriate for everyone in my demographic. The sad thing I found when researching this article was that there were so few ads that did not depict women as secretaries, support people, mommies or ditzes. There were few ads that didn’t make men look like ignorant dunces unable to change their shoes or brilliant 1950’s style businessmen with a little women hanging on his every word. As a small business person you CAN take over big time competitors with big time national ad budgets if you are very cognizant of who your target customer is and target your marketing to reach them. If you have favorite commercials that are missing here, please leave your demographic details, a small synopsis and a link to the ad and we will add it to the list!!! !